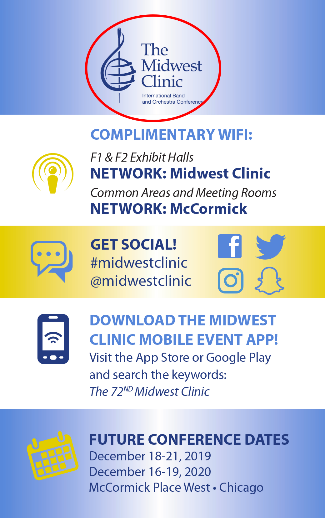 With over 18,000 annual attendees representing all 50 states and over 30 countries, The Midwest Clinic is the largest instrumental music education conference in the world. There is no better place to showcase your company and brand through one of our sponsorship programs. *Only attendees that have opt-ed in to participate will be included (4,300+). Lists only included music education professionals and college students. Exhibitors and K-12 students are never included on any Midwest list. Banner with sponsor image displays at the top of the conference mobile app to create brand awareness (rotates between sponsors). Viewed 1.5 million times during the 2018 conference. Sponsor logo displayed outside Skyline Ballroom W375AB prior to the opening concert of the conference. Sponsor(s) may also greet attendees as they grab a cup of java prior the official start of the conference. Sponsor logo displayed at the “Jammin’ at the Hilton’ nights (Wednesday, Thursday, Friday evenings) in the 720 lounge. Sponsor logo will be displayed prominently on the backside of conference badging. That’s over 18,000 people that will become walking billboards for your brand! Your company name/logo displayed on the official shuttle buses, which run continually between the McCormick Place West and the hotels listed above. This not only gives exposure to over 8,000 attendees that utilize this service, but is also seen by all traffic during driving time. Sponsor logo printed on the shuttle bus passes distributed to over 8,000 attendees. Sponsor logo displayed on information booth located at the main entrance of McCormick Place West. Sponsor logo displayed on all supporting marketing collateral (signage, email campaigns, t-shirts, tote bags) for this most special one-day event for future music educators. Attendee lanyards co-branded with your logo and The Midwest Clinic. Worn by over 18,000 attendees. Your company name and logo will be the first thing seen by over 18,000 attendees on all registration check-in kiosks.